Recently, I've been playing drop-in hockey at Hillcrest Community Centre because I needed more practice. 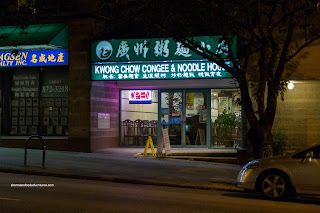 After every game, Milhouse, Gordo and I have made our way over to Kwong Chow for some late night eats. If you can believe it, I've been doing this without a camera or any intentions of blogging about it. However, this week was different. Apparently, Stripes figured out that I was the food-blogging goalie. Hence, he wanted to join us for eats as well. Therefore, to give him the full-meal deal, I decided to lug out the DSLR. Keeping inline with its namesake, almost all of us had the Wonton Noodles. 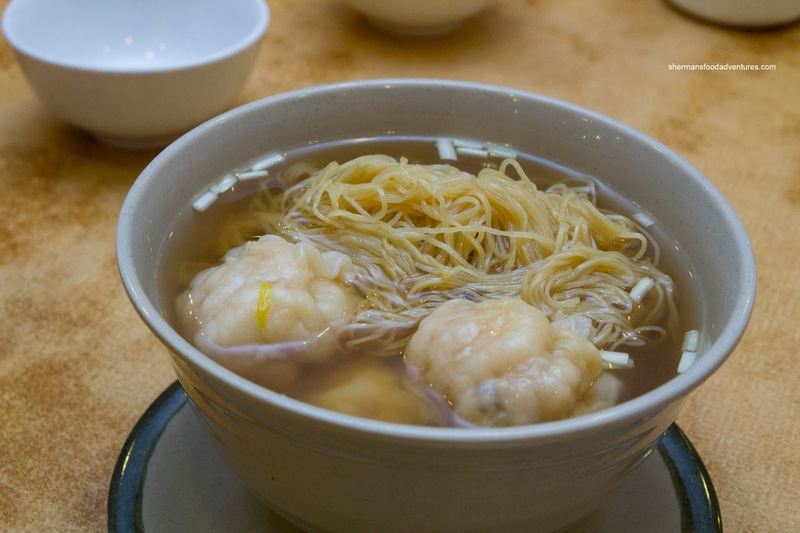 For me, I find it quite competitive with the other good wonton noodles in town (which include Congee Noodle King, Congee Noodle House, Ho Yuen Kee, Michigan, Neptune, MaxNoodle). The soup base itself packed lots of flavour while the noodles having that chewy "just barely cooked" quality. As for the large wontons, they were comprised of large chunks of crunchy shrimp and a bit of pork filler. We ended up sharing 2 dishes starting with the Salted Fish & Chicken Fried Rice. This was not bad as there was proper wok heat where the rice was dry and chewy. 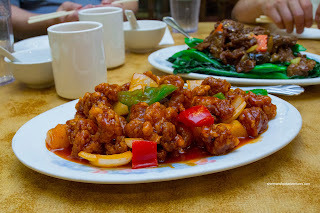 There was plenty of salted fish and moist nuggets of chicken which added plenty of flavour. We also had the Rice Noodles with Bak Choy & Beef which arrived as a fairly large portion. The noodles were lightly fried up (with only a modest amount of oil) where they were soft without falling apart. 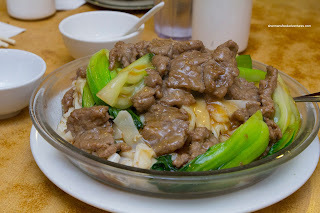 The starch-thickened sauce had a nice consistency and was generally quite mild while the beef was properly tenderized and the Shanghai bak choy was still crisp. On the following Thursday, we made our 4th straight visit after hockey (must be some kind of record for me). 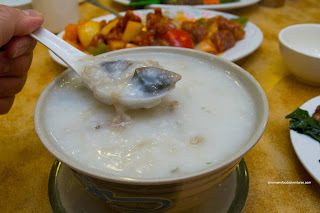 I ended up going for their other specialty being the congee, specifically the Preserved Egg & Salted Pork Congee. Sadly, the broth was not thick enough and became watery shortly after my first few spoonfuls. Despite the good amount of preserved egg, the salted pork was shredded to the point it was almost not there. Furthermore, I didn't get much flavour from the broth or the pork itself. Much like last time, we ended up sharing a few things including the Sweet & Sour Pork. It was a modest portion consisting of small chunks of pork. There was a mix of fatty and meaty pieces which were fried up crunchy, yet with chunks so small, we really didn't get much meat texture. As for the sauce, it was quite balance between tart and sweet. 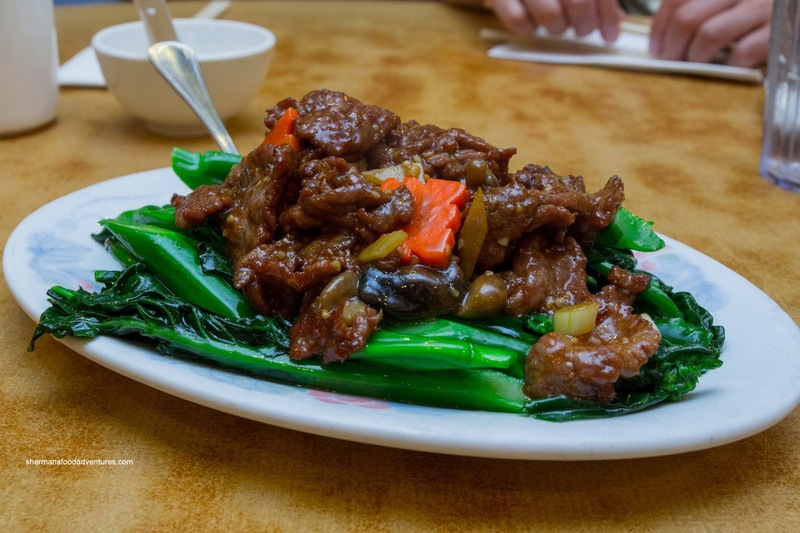 To get some veggies in our pathetic diets, we got the Gai Lan with Beef. 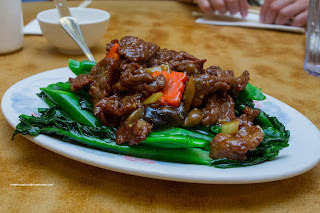 We found the gai lan to be a bit overcooked lacking the usual crunch. On the other hand, the beef was properly tenderized where it was easy to chew while still maintaining a meat texture. It was overseasoned though being quite salty. Overall, from all the visits, we agreed that Kwong Chow is a decent place for late night eats. However, the nearby Congee Noodle House is probably a better choice. 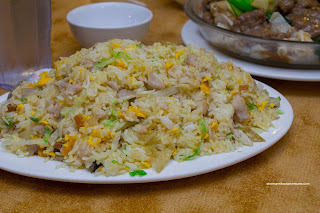 @tony There are various places with shredded chicken salad for Dim Sum that are decent, but nothing stands out. I like the one from Koon Bo of course. Yah, last time I was at On Lok, the food was nasty. Wonder if it was a one-off?